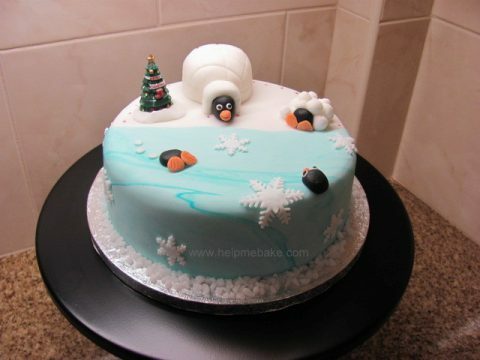 Brrrr a penguin family Christmas cake. This is a rich fruit cake topped with Courvoisier. I made the penguins using black, white and orange Renshaw’s ready to roll icing. The Christmas tree is out of a decoration set and is the only thing on the cake that isn’t edible. The igloo was handmade and shaped using white icing and then scored with a design wheeler to create the block effect on it. I then used push cutters to make the snowflakes. I lightly dusted the snowball pile, igloo and Christmas tree with a little icing sugar to add additional effect.